Designed for connecting professional video equipment, the Teradek Link Dual-Band Wi-Fi Router is more robust than consumer routers and access points. Teradek devices that use Wi-Fi can benefit from the greater throughput provided by the Link and its 1000' range. A light stand adapter is included for mounting versatility. A power supply, a 2-pin to D-Tap cable, and an Ethernet cable are also included. 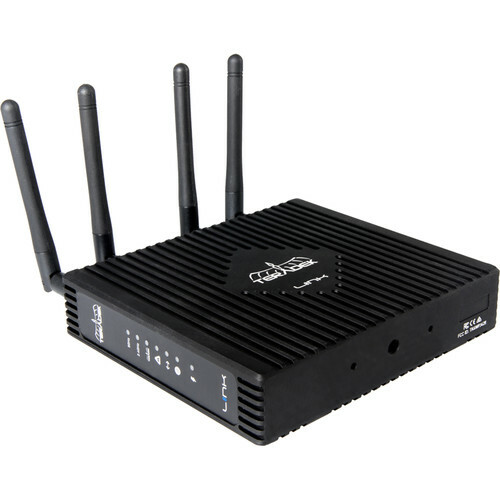 Supports common Wi-Fi standards, such as 802.11ac, and legacy Wi-Fi 802.11a/b/g/n standards for compatibility with a wide range of devices. 1000' coverage is provided for connecting to on-set devices. Link's quad core processor and significant internal memory ensure high data throughput despite numerous clients utilizing the network at once. Compared to typical consumer access points, Link offers optimized buffering and packet re-transmission, allowing you to maintain a consistent connection even in tough RF environments. Link's aluminum chassis allows it to withstand the daily abuse common in production environments or in the field. With several 1/4"-20 mounts, the device can easily be mounted onto light stands, DIT carts, or OB vans. Link's passive PoE connection allows the system to be powered in line with the Teradek Sphere or any other PoE injector for a more streamlined setup on set. Box Dimensions (LxWxH) 6.7 x 6.7 x 4.75"
I've a Teradek bolt, I'm wondering if this can be used with it? You cannot. Teradek Bolts are self contained transmission systems. This product gives you a strong WiFi signal to use with Teradek streaming, encoding and decoding products like the Vidiu and Cube line up of products.